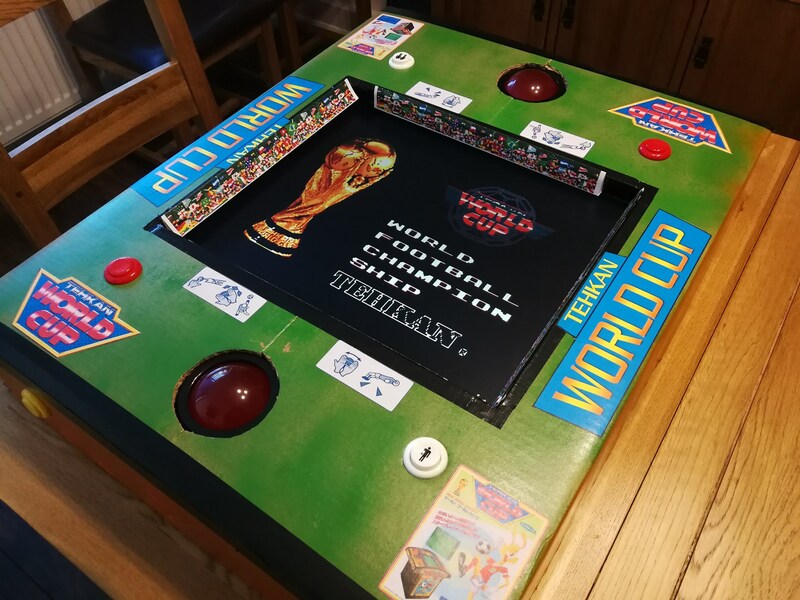 I really, really love this arcade game, so much so that me and my dad have made a real version of it out of wood and card board! Now to beat the game and win the world cup 🙂 7 rounds, each one harder than the previous one. i love this game too. It´s my preferer arcade game of the all time. Your machine is amazing!!!! Can you tell me how you made it? I would love to see pictures from inside. what kind of electronic did you use? Jamma board, computer, raspberry pi? Hi Javier, This was a project me and my dad made. (It is one of his favorite games too) We used a strong cardboard box! This is a “cardcade” machine! Inside we used a PC, TFT Monitor and strengthened it up with MDF wood. We used real arcade buttons and wired them to a Mini Pac for use with MAME. The expansive parts were the USB trackballs made by HAPP but these were essential for the game to be realistic. We then painted it and added the stickers. I will take some photos for you and add them to one of my blogs. If you have any pictures or videos of you playing Tehkan I would love to see them and share them on my website!